Ardour 5.12 is now available. Although when Ardour 5.11 was released, we expected a significant gap until 6.0 will be announced, enough notable features and fixes accumulated that it seemed better for us to push out a 5.12 release before we embark on the major code changes that will mark the real start of the development process for 6.0. Much of the work in this release was sponsored by Harrison Consoles. Two of the most notable new features are the improvements in functionality to the new session and new track/bus dialogs, which now offer much easier and more powerful ways to use templates. These include dynamic "track wizard" templates that allow you to interactively setup sessions and/or groups of new track/busses very quickly and very easily. This builds on the new template manager dialog introduced in 5.11, and a new less obvious feature: the ability to create dynamic templates with Lua scripts. Also notable is the new patch selection dialog for MIDI tracks/instruments, which provides an easy and convenient way to preview patches in software and hardware instruments. Naturally, it integrates fully with Ardour's support for MIDNAM (patch definition files), so you will named programs/patches for both General MIDI synths and those with MIDNAM files. Improvements to the template manager dialog. Lua templates for tracks and sessions can now be created/scripted. New session dialog functionality improved, with new templates and track wizards. New track dialog functionality improved, with new templates and track wizards. Expose Lua bindings for VCA create/delete/assign/unassign. 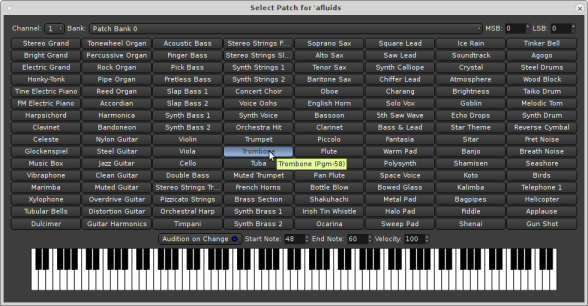 New patch selector dialog for MIDI tracks. This can be accessed by right clicking in the track header area. Ardour's generic GUI for instrument plugins now includes a keyboard to allow auditioning the plugin settings. Display playback-only devices when using JACK. Support for a new LV2 extension to notify the host about MIDI bank/program changes (e.g. driven by the plugin's own GUI). Faderport 8: double-click on select button resets gain to 0dB. Fix MIDI quantization when not using US English. Fix selection of quantization note-end grid size. Catch exceptions thrown from Lua scripts. Fix handling of MIDI channels in the Transform dialog. Improve the heuristic used to display track/bus I/O connections in a compact form, as well a connection menus. Clicks on I/O menus now always connect, rather than toggle connected status. OSC: gracefully handle the user sending the wrong number of parameters. OSC: changing jog mode no longer stops transport unless started by scrub/shuttle. Secondary clock visibility is now a global preference rather than a per-session setting. The editor's summary view is now constrained to the extent of actual regions, rather than the session extent, by default. This can be reset from a right-click on the summary. New configuration setting for playhead auto-scroll speed. If you want to scroll quickly, it is preferred to zoom out first, then scroll. New configuraton setting to define how much zooming will be easily allowed beyond the extents of actual regions in the session. Generic plugin GUI: fix sizing and layout for automation state controls in plugins with many controls. Increase priority of the thread involved in automation recording. This fixes an issue with sparse automation recording when the CPU is busy. Update the included version of NSS (a secure networking library), to provide some features required by some plugins. Fix the way MIDI filenames are "bumped" during snapshots and playlist copying. Fix crash bug in Ableton Push 2 support, introduced in a recent version. Fix various tooltips to avoid problems with special characters in their text. Catch some exceptions during session loading. Relax some restrictions imposed by the Lua sandbox (for scripts).